New Delhi: A Mint investigation shows what appear to be significant irregularities in the Union government’s October award to 31 companies of mining rights for 15 coal blocks with reserves worth around Rs5.37 trillion. It turns out that nine of the 31 companies were awarded rights despite being rejected in earlier stages of the bidding process for not meeting the government’s prescribed criteria. And it emerges that the government overruled a recommendation to restrict the number of companies awarded rights at 28. Meanwhile, six of the companies that were shortlisted because they did meet all the prescribed criteria were dropped. The nine companies that were initially rejected but later benefited from the government’s decision are: GVK (Govindwal Sahib) Ltd, Green Infrastructure Pvt. Ltd, Gagan Sponge Iron Pvt. Ltd, Visa Power Ltd, Tata Power Co. Ltd, SKS Ispat Power Ltd, Prakash Industries Ltd, Vandana Vidyut Energy Ltd and Bharat Aluminium Co. Ltd. The issue raises significant questions about procedures that the government ignored, more so since the ministry of coal, which awarded the rights, is headed by Prime Minister Manmohan Singh. The shortlist, recommending which companies be allotted mining rights, was prepared by the ministry of power. The 15 blocks were reserved for the power sector for captive plants, which means coal from them would have fuelled thermal power plants being set up by companies for their own use. “The final list of allottees has many companies (that) were rejected at various levels of short listing," complains an executive at one of the six companies, who didn’t want to be identified for fear of future reprisals. “As a result, many eligible companies, with much better levels of preparedness, have lost out." 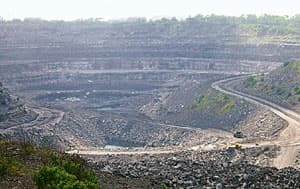 Valuable resource: A view of a coal mine in India. Fifteen coal blocks were reserved for the power sector for captive plants, which means coal from them would have fuelled thermal power plants being set up by companies for their own use. “It is true that there are some companies which did not figure in the shortlist," he said. “But, the shortlist is more like a recommendation. The screening committee gets recommendations from the state governments, both where mining will be done and where the end project will be set up, which are equally important. Moreover, (the) ministry of power, implicitly, agrees with the final decision as it was also part of the screening committee." Gupta heads the screening committee that takes the final decision on the allotment before it is sent for the Prime Minister’s approval. Apart from the ministry of coal, the screening committee includes officials from the ministry of power, state governments where the blocks are located, state-owned coal firm Coal India Ltd, Central Mine Planning and Design Institute Ltd , ministry of environment and forests, and the Indian Railways. Gupta declined to answer more questions on the allotment. Nor did he respond to a detailed questionnaire faxed to his office. Sushilkumar Shinde, the Union power minister and Anil Razdan, secretary in the ministry of power, also declined to comment on the variations between the shortlist provided by their ministry and the final allotments made by the ministry of coal. “I have nothing to say," said Razdan. “Please talk to the coal secretary since he is the one who has decided (on this)." Razdan did not respond to a detailed questionnaire faxed to his office. The allocation process was set in motion between 20 June and 23 June, when 187 companies applied for the 15 coal blocks with geological reserves of 3.6 billion tonnes of coal that can support power generation of 16,000MW a year. According to Dipesh Dipu, a manager at audit and consulting firm PricewaterhouseCoopers, the reserves translate into 2.25 billion tonnes of mineable resources, or 70-75 million tonnes of coal, a year. Industry estimates put the current pit-head price (a technical term that means “at the mine site") for Indian coal at around $59 (Rs2,407.20) per tonne; spot prices could be still higher. According to Dipu, companies are interested in acquiring coal mines because most believe that their cost of production of the fuel could be up to 40% less than Coal India’s production costs. Of India’s 135,000MW of power generation capacity, coal-based power projects account for 89,309MW. Although there were 187 bidders, there were 745 applications because most companies applied for more than one block for the power projects they were developing, and some wanted to use the same block for multiple power projects. The coal ministry said that the annual award of coal blocks to government companies as well as captive power units operated by the power sector started in 1993. Between 1993 and 2002, rights on a total of 19 blocks were allocated. Between 2002 and 2004, rights on an additional 25 blocks were allocated. And since the United Progressive Alliance (UPA) took charge at the Centre in 2004, rights on around 165 blocks have been allotted. According to the ministry of coal, between 1993 and 6 November 2007, coal blocks for the power sector were awarded to 62 companies including some state-owned ones. An official at the coal ministry said the shortlist provided by the power ministry was unusual because there was no precedent for this. The shortlist was created for the ministry by the apex planning body in the power sector, the Central Electricity Authority (CEA). “The coal ministry did not ask for it (a shortlist). The power ministry did it on its own," added the coal ministry official, who did not wish to be identified. CEA pruned the number of applicants from 187 to 44 in two stages. In the “pre-qualification" stage, CEA evaluated companies on the basis of net worth of the company (the sum of equity and reserves) and the capacity of the proposed power project. It rejected all applications that involved power projects witha capacity of 500MW and less. As a result, only 115 companies out of the initial 187 qualified for the next round of scrutiny. Three companies that were among those eventually allotted mining rights, Vandana Vidyut Energy, GVK (Govindwal Sahib) and SKS Ispat Power, were among those rejected by CEA. During the second stage of scrutiny called “short listing", CEA evaluated 115 applicants on their readiness for the project. It ranked them on the basis of the status of their land acquisition efforts for the projects concerned and the allocation of water by the state where the project was located. It also left out applications from state- and Union government-owned companies because they are entitled to coal mining rights under a separate quota. The number of eligible companies at this stage came down to 44. Gagan Sponge Iron and Prakash Industries did not figure in this list, although both would eventually end up with mining rights. CEA sent its list to the ministry of power along with a suggested order of preference. It also advised that the government run a check on the information provided by the companies again. On 30 July, the ministry of power forwarded the list to the coal ministry suggesting that all the information be verified. The ministry of coal, in turn, asked the respective state governments to conduct an exhaustive due diligence of the 44 companies. This resulted in 16 companies being dropped from the list. The companies dropped included Visa Power, Tata Power, Green Infrastructure and Bharat Aluminium, all of which would also be eventually awarded rights. In its meeting on 13 September, the screening committee recommended a list of 31 companies to Prime Minister Singh. Not only did the committee allot blocks to more companies than those recommended, it also included nine companies that had been rejected at different stages of scrutiny. The six companies that were dropped to make way for these were: Rashmi Cement Ltd, Bhushan Energy Ltd, TRN Energy Pvt. Ltd, Mahavir Global Coal Ltd, Vedanta Alumina Ltd, and Maithon Power Ltd (a joint venture between Tata Power and Damodar Valley Corp.). TRN Energy and Mahavir Global could not be reached despite several attempts. Vedanta Alumina is part of the Vedanta Group of which Bharat Aluminium, one of the nine companies allotted mining rights despite being rejected at a prior stage in the bidding process, is a part. Tata Power is another such beneficiary. Executives at the other companies did not wish to comment. A CEA official, who did not wish to be identified and was closely associated with the shortlisting exercise, alleges that the final selection by the screening committee had ignored merit. “The shortlist was based on merit and eligibility of the different companies," the official said. “The data used in the process was furnished by the companies to the ministry of coal. But, sadly, this is how the government functions. The ministries of coal and power have their own agenda. If the concerned state governments say they will support a particular company or project, then our shortlist can be superseded." An official at the ministry of coal confirmed that the ministries of coal and power had differed on the awarding of the rights. “...it would be wrong to base your decision on the premise that the CEA shortlist is the only way to decide. If you base it on it, then I can’t say anything," added the official, who did not wish to be identified. Elaborating on the guidelines adopted for the screening committee, the coal ministry official said: “It included the status of the project, which is the most important concern, a match between the project’s requirement and the resources available at a block." He added that the decision also factored in the views of the power ministry and the concerned state government. According to CEA, the short-listing process it conducted was based on the same criteria. Of the nine companies, only Bharat Aluminium had acquired the land for the project at the time of CEA’s shortlisting exercise. Seven of the nine companies—GVK (Govindwal Sahib), Visa Power, Tata Power, SKS Ispat Power, Prakash Industries, Vandana Vidyut Energy and Bharat Aluminium—did not respond to emailed queries from Mint. No email address could be obtained for Gagan Sponge Iron and Green Infrastructure. A physical verification, too, drew a blank. In the case of Gagan Sponge Iron, security guards on location denied the existence of any such company. The said location housed Jindal Intellicom Centre, an OP Jindal Group company. In an email reply, an executive at Jindal Intellicom said: “Gagan Sponge Iron Pvt. Ltd is not a name I am familiar with. As an answer to your question, Intellicom Contact Centers is not associated with a company by that name." In the case of Green Infrastructure (GIPL), the address did not house the company. Mint was directed to the office of Athena Consultancy, inthe same building in Delhi’s posh Sujan Singh Park area. Athena Consultancy claims to be a consultant to GIPL. An official at Athena Consultancy introduced Mint to one Ashok Bohra, identifying him as the vice-president of GIPL. However, Bohra declined to comment and clarified that he was only a deputy manager at GIPL. Bohra asked Mint to contact T.V. Krishna and identified him as the managing director of GIPL. However, Krishna, when contacted, denied that he was the managing director of GIPL and claimed he was only a director on the board of Athena Chhattisgarh Power Pvt. Ltd (ACPPL), the company that would actually make use of the coal block allocated to GIPL. According to him, GIPL was only the holding company. It is unclear whether CEA or the ministries of power and coal are aware of this complex arrangement. Rights awarded to the companies in this case are for captive power generation and cannot be sold or transferred to others. “A holding company can get the coal mined by another company if the holding company has at least 26% stake in the mining company. However, the power generation must be for the same project for which the coal was granted," said Dipu of consultant PricewaterhouseCoopers. Krishna confirmed that there was no Web or email address for GIPL or ACPPL and explained this by saying “GIPL is only the holding company...and ACPPL is only a special purpose vehicle." A special purpose vehicle is a company set up for a specific purpose or project. Krishna also said the land acquisition for the project was not yet complete but denied any knowledge of the shortlisting process. “Land acquisition is an ongoing activity. We were asked for some information for verification purposes by the concerned state governments but we are unaware of any short-list," said Krishna. PricewaterhouseCooper’s Dipu said: “It is true that the recommendations of the screening committee are entirely subjective. However, the fact that there are many parties involved in the decision-making, lends credibility to the otherwise subjective process. Although, it cannot be denied that a big enough player can influence all the decision makers." Abani Roy, a Rajya Sabha member belonging to the Revolutionary Socialist Party, a constituent of the four-party Left Front that supports the government, says he had written to Prime Minister Singh in September urging him to ensure that only “deserving companies" were allotted coal blocks. “There is no response except that the letter has been received. And, there is no follow-up either," Roy added.